David Perri, the inventor of “Gotta Go”, has trained a wide variety of exotic and domestic animals for over 20 years. In the DVD, David demonstrates his effective philosophy in successful pet training involving his positive approach. It will help you learn the ABCs of successful animal training, eliminate dominance training and pet abuse, along with the easy process of training your pet to chime in with his needs. The “Gotta Go” Dog Doorbell is an ingeniously easy way for pets to their relief needs. 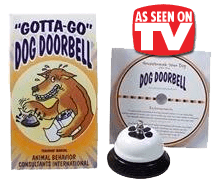 The DVD shows the 3 simple steps in behavior training required that will quickly put your pet in the habit of ringing his bell in a wish to go outdoors to do his duty. A fantastic training and bell-ringing package which includes a step by step manual, instructional video and bell that will enhance the relationship between you and your pet! The “Gotta Go” Doggie Doorbell helps solve your dog housebreaking problems. Simply the best method to train your pet to let you know when he or she needs to go outside to use the bathroom. “You’ll always know when your pet needs relief! The “Gotta-Go” Dog Doorbell Kit Includes everything you’ll need to house train any dog!! “Herman” is taking notice of ringing the bell each time we go out. Herman is a very smart 7 month old Doberman. What was so funny, Herman touched the bell when he came in the house. I’m trying to get a picture of him touching the bell on the way out, which I will send to you. “Gotta-Go” Doggie Doorbell is a great product, and idea. I love it, Herman loves it. It’s a great way to communicate.